Electronic Music Composer, Jody Lloyd aka Trillion Branson blends computer generated and recorded sounds with live instrumentation, percussion, spoken word rap & singing. This unique combination of live DJ technology and Sound Therapy techniques is designed for your deepest relaxation, reflection and to attune you to the most perfect known frequencies. Short Bio: Jody Lloyd is a music producer/songwriter and poet from New Zealand. Starting out as a rapper in his teens, he was later signed to Universal Records. That experience led him to operate his own recording label producing and releasing over 25 albums to date. With Perfect Freq, Jody has composed a body of music that blends electronically generated sounds with vibrational healing techniques, while learning more as assistant to Sound Healer, Shervin Boolorian. This process is being captured by New Zealand based documentary film maker, Slavko Martinov. Sound healing is the therapeutic application of sound frequencies to the body/mind with the intention of bringing them into a state of harmony and health. All organisms have a vibration rate. Every object in the universe has its own unique resonant frequency. Each organ, every bone and all cells in the body have their own resonant frequencies. Together they make up a composite frequency - like all the instruments in an orchestra. When one organ in the body is out of tune it will affect the whole body. Most music in western culture is categorised as entertainment - but music in many cultures has historically held a deep sacred space in hearts and minds and often used as a catalyst for spiritual insight, wisdom, transformation and emotional growth. The energy or intention that is encoded into the sound is as important as the actual sound. The Perfect Frequency is LOVE. 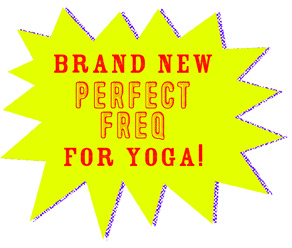 And while being written and recorded, the music on Perfect Freq was encoded with the vibration of love. Sound by itself has an inherent transformative power, but when we mix sound/music with pure intention to attune and transform the consciousness, we come into a powerful state. Sound Healing is the intentional use of sound to create an environment that becomes a catalyst for healing - whether it's the physical, mental, emotional or spiritual aspects of ourselves. To become HEALED simply means to become WHOLE. Through the principle of resonance it is possible to use sound to bring the body and mind into harmony.